A massive e-waste landfill in Guiyu, in southern China’s Guangdong province, is much more than a graveyard for old computers, says an investigative US writer based in Shanghai. Electronic waste can be highly toxic and needs to be disposed of safely. Adam Minter, author of the Shanghai Scrap blog, says he found boxes of defective but unused electronic components discarded at Guiyu – still in the original packaging from HP, Panasonic and Samsung. But Samsung Electronics denies any involvement in discarding the equipment, and says the components were manufactured many years ago. HP and Panasonic did not comment on the specifics of the case. Mr Minter himself says that most of the e-waste dumped in China does not come from the West as before, but from Asia and especially China itself. The writer has highlighted the e-waste issue many times before, not only on his blog, but writing for publications like Bloomberg, the Wall Street Journal and Scientific American. 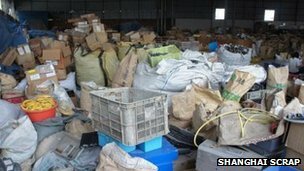 The town of Guiyu, made up of four small villages on the South China Sea coast, first made headlines in the early 2000s, as one of the places where old computers and gadgets from the western world were getting recycled. A steady stream of used electronics started to arrive from about 1995 and made Guiyu one of the world’s largest electronic waste sites. It also gave birth to a new industry in the area – e-waste recycling. And this is what they have been doing ever since – sifting through old gadgets and stripping components that could be re-used and re-sold, burning wires to get copper, using acid baths to extract gold from microchips. All these operations and the toxic fumes they produce have dangerous effects on the land, and most of all, on people. The soil in Guiyu has been found to be so saturated with heavy metals such as lead, chromium and tin that groundwater has become undrinkable. According to China’s Shantou University, the town has the highest level of cancer-causing dioxins in the world, and local children suffer from an extremely high rate of lead poisoning. And now, says Mr Minter, it is not only old computers that are being thrown away there. The disposal of new and unused electronics is aggravating the problem even further. The writer took photos of the boxes he had found. Many of the packages had “out of warranty” labels on them. 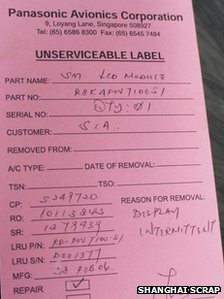 Mr Minter contacted the companies mentioned on the labels, although he concedes that the unused electronic components may not have come from the manufacturers directly, but through an e-waste trader. “Of course it may be that they were dumped by some local company and HP and Samsung didn’t know it was happening, but the fact that they’ve declined to answer my questions is weird in itself,” says Mr Minter, who is writing a book about the problem of electronic waste around the globe. When approached by the BBC, Panasonic did not comment. Samsung Electronics denied any involvement. The firm said that it was a member of the e-Stewards Electronics Stewardship campaign of the Basel Action Network, a US-based charitable organisation that works to stop the export of toxic waste to the developing world. Members promise to deal only with recyclers who process the material properly. 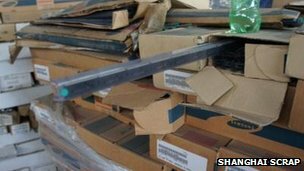 “Based on our internal investigation, we confirmed that the boxes were not discarded by Samsung Electronics or by one of Samsung’s recycling partners,” the company said in a statement to the BBC. “Furthermore, the semiconductor components contained in the boxes were manufactured in 2004 and had been shipped to a customer overseas. The electronics giant stressed that it was committed to enforcing strict global standards for proper e-waste management to “protect the environment, people, and developing countries from the hazards of electronic waste”, and had established recycling programmes all over the world to comply with global recycling laws, “regardless of legal requirements, to continue to minimise electronic waste”. HP did not comment on the specifics of the case, but a spokesman said the company was committed to meeting the highest e-waste management standards. 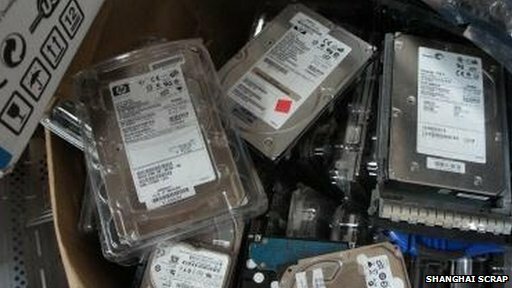 Although very recently the west was the main source of e-waste in Asia – it is estimated that people in the United States, for instance, throw away more than 350,000 mobile phones and 130,000 computers every single day – Mr Minter says that tables were now turning. “Half of the e-waste currently being processed in China is generated in China,” he says. He said that he spoke to several Chinese e-waste traders in Guiyu, who told him that half of all e-waste being processed there is domestically-generated. “This comports with my walks through the area, seeing waste being processed there,” he says. He adds that many traders and processors in Guiyu complain about this, as US and EU e-waste is usually of much higher quality – newer – than Chinese, and thus easier to break down and re-sell into China’s vast re-use market. “They would like more; they can’t get it. The laws and regulations of the US and EU are really starting to bite down,” he says. “As for South East Asia – it’s been a developed region for 10 years, and thus it’s starting to throw off first and second generation e-waste.